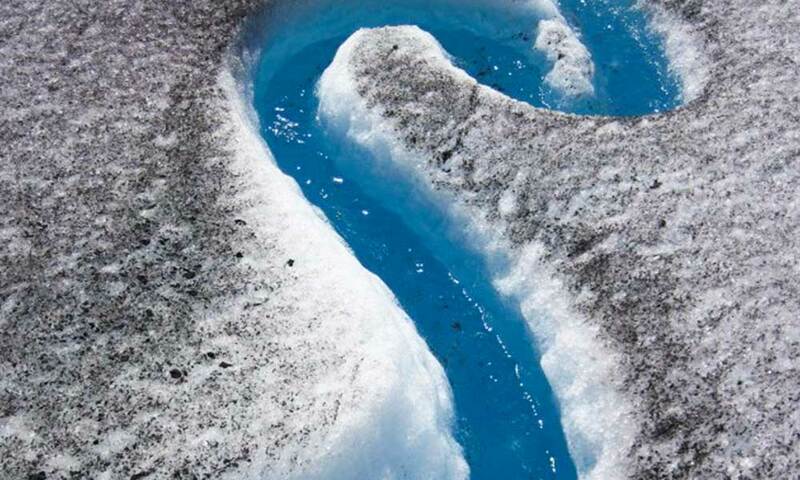 Explore not just the glacier, but the stunning landscape that was influenced by this river of ice. Follow the leader! Your knowledgeable guide knows just where to find all the glaciers hidden gems. Working together to get there! Explore Mendenhall Glacier from a much closer perspective on the Mendenhall Glacier Trek Tour. This full-day adventure is not for everyone, but geared towards those looking for a challenge and ready to hike to get there. Gaining elevation from the trailhead, temperate rainforest eventually gives way to alpine terrain, where you'll need micro-spikes for glacier traversing. Spend the next hour or so on the glacier, following your guide past deep blue melt streams, emerald pools and deep crevasses. The scale of these flowing glaciers becomes evident as you zig-zag along in what may feel like a different world. A truly awe-inspiring trip for those ready for it. Pick-up from the cruise docks and many Juneau hotels is included and from there a short ride over to Mendenhall Valley and the West Glacier Trailhead. Here it's time to gear up, and a backpack containing all your necessary glacier gear is provided for you (about 10-15 lbs.). Hit the trail, warming up on the first mile which is well maintained and relatively flat. It doesn't take long to shift gears - now you're in the Alaskan backcountry, and the cruise ship seems miles away. After the first mile, the trail gains elevation and the next 2.5 miles are characterized by uneven terrain, multiple steep pitches, rock scrambling, route finding and may include slippery bedrock. But the hard work pays off when the trail opens up to expose a glorious view of Mendenhall Glacier, which leads into the next part of this adventure. Traverse across the last patch of bedrock, making your way over to the edge of the icefield. Gear up with micro-spikes, and begin the next part journey on the ice, exploring the unique intricacies of this frozen expanse. If time permits, we may have an opportunity to explore nearby ice caves; the resulting photos from this trip may seem Photoshopped but these colors are real! Eventually, we'll make the return trip back to the trailhead and drop-off locations in Juneau. If you're concerned with slowing down the group or if you have younger children, you may consider taking this as a private trip. Contact us for special pricing for private trips to enjoy the day more at your own pace with a private guide. Keep it moving! For a perfect Inside Passage active package, check out the Orcas Cove Kayak in Ketchikan, and the Rock Climbing, Rappelling, and Ziplining Expedition in Skagway! Restrictions: The minimum age for participants is 10 years old. Accessibility: Must be fit enough to hike for 7+ hours covering over 8-9 miles of strenuous terrain (see trip description above) carrying a 10-15 pound backpack. What to Wear: We recommend you prepare for rain and hope for sunshine in regards to the weather. Due to the cool, damp climate, it is best not to wear cotton and instead, wear clothing made of polyester, wool, fleece, nylon, polypropylene and/or capilene. A full list of what to bring and how to prepare will be included in your confirmation email. Because much of SE Alaska is a rainforest, these trips do operate rain or shine. Rain jackets and pants are provided on this trip. If weather conditions are unsafe, the trip will be canceled and we will provide a full refund. Q:What can I do to prepare physically for this trip? Cardiovascular training is a must. You will be hiking approximately 8 miles roundtrip for 7+ hours on uneven terrain. Cardiovascular training will increase your endurance making for a more pleasant experience on the trail. In addition, get yourself out on a hike and choose trails that are uneven. We oftentimes get people who are in good physical condition (i.e. train at the gym daily, run several times a week), but struggle on the uneven surface because they are used to exercising on flat ground, which does not require much balancing and much use of the small muscles in the legs and ankles. Q:What's the weather like on the glacier? Is it cold? Juneau temperatures during the summer are typically between 50 and 65 degrees, with an average of 56 degrees Fahrenheit (13 degrees Celsius). The temperature on the glacier is about 5 degrees cooler, but can feel up to 15 degrees cooler due to katabatic winds (cold downslope winds coming down the glacier). Please bring layers of clothing including a warm hat and gloves. There can be up to 12 participants on this trip and there is a minimum of 2 guests for the trip to operate. With advanced notice we can accommodate larger groups on private tours. The area that we travel on is in the ablation zone, the section of the glacier that is melting and not covered in snow half the year. The surface is wet, a little bit dirty, slippery, and uneven with crevasses and seracs (towers/fins of ice) adjacent to and in our trekking routes. It is wet due to melting ice and from the meandering melt-water streams. It is dirty due to the movement of the glacier scraping the sides of the mountains, winds blowing dust and debris onto the ice, and 150 years worth of atmospheric dust settling onto the glacier. To prevent us from sliding while walking on the ice, we wear micro-spikes. The specific route taken on the glacier is selected by the guides to meet the ability and adventure level of the clients. 30 minutes: Pick-up and cruise docks and transportation to West Glacier Trailhead. 30 minutes: Time set aside for orientation, gear fitting and preparing backpacks for the day. 2.75 hours: Hit the trail, climbing through temperate rainforest and gaining elevation en route to the icefield. 1 hour: Glacier traversing with micro-spikes and trekking poles. 2.75 hours: Return hiking portion back towards West Glacier Trailhead. 30 minutes: Degear, decrompress and return van transfer to downtown Juneau and cruise docks. Note: The exact amount of time spent on the glacier will vary from group to group and may be less than an hour. This depends on the group's pace and other conditions such as weather on the day of your trip. Certain features such as ice caves cannot be guaranteed and ultimately are up to the discretion of the guide based on safety conditions that day.